Copyright 2014 The Author-Distibuted under the Creative Commons Attribution 3.0 License. (CC BY). By bringing new nutrients and particles to the surface ocean, atmospheric deposition impacts biogeochemical cycles. The extent to which those changes are modifying the carbon balance in oligotrophic environments such as the Mediterranean Sea that receives important Saharan dust fluxes is unknown. The DUNE (DUst experiment in a low Nutrient, low chlorophyll Ecosystem) project provides the first attempt to evaluate the changes induced in the carbon budget of a large body of oligotrophic waters after simulated Saharan dust wet or dry deposition events, allowing us to measure (1) the metabolic fluxes while the particles are sinking and (2) the particulate organic carbon export. Here we report the results for the three distinct artificial dust seeding experiments simulating wet or dry atmospheric deposition onto large mesocosms (52 m3) that were conducted in the oligotrophic waters of the Mediterranean Sea in the summers of 2008 and 2010. Although heterotrophic bacteria were found to be the key players in the response to dust deposition, net primary production increased about twice in case of simulated wet deposition (that includes anthropogenic nitrogen). The dust deposition did not produce a shift in the metabolic balance as the tested waters remained net heterotrophic (i.e., net primary production to bacteria respiration ratio <1) and in some cases the net heterotrophy was even enhanced by the dust deposition. The change induced by the dust addition on the total organic carbon pool inside the mesocosm over the 7 days of the experiments, was a carbon loss dominated by bacteria respiration that was at least 5-10 times higher than any other term involved in the budget. This loss of organic carbon from the system in all the experiments was particularly marked after the simulation of wet deposition. Changes in biomass were mostly due to an increase in phytoplankton biomass but when considering the whole particulate organic carbon pool it was dominated by the organic carbon aggregated to the lithogenic particles still in suspension in the mesocosm at the end of the experiment. Assuming that the budget is balanced, the dissolved organic carbon (DOC) pool was estimated by the difference between the total organic carbon and the particulate organic carbon (POC) pool. The partitioning between dissolved and particulate organic carbon was dominated by the dissolved pool with a DOC consumption over 7 days of ∼1 μmol C L-1 d-1 (dry deposition) to ∼2-5 μmol C L-1 d-1 (wet deposition). This consumption in the absence of any allochthonous inputs in the closed mesocosms meant a small <10% decrease of the initial DOC stock after a dry deposition but a ∼30-40% decrease of the initial DOC stock after wet deposition. After wet deposition, the tested waters, although dominated by heterotrophy, were still maintaining a net export (corrected from controls) of particulate organic carbon (0.5 g in 7 days) even in the absence of allochthonous carbon inputs. 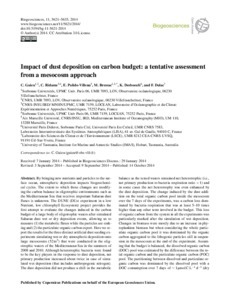 This tentative assessment of the changes in carbon budget induced by a strong dust deposition indicates that wet deposition by bringing new nutrients has higher impact than dry deposition in oligotrophic environments. In the western Mediterranean Sea, the mineral dust deposition is dominated by wet deposition and one perspective of this work is to extrapolate our numbers to time series of deposition during similar oligotrophic conditions to evaluate the overall impact on the carbon budget at the event and seasonal scale in the surface waters of the northwestern Mediterranean Sea. These estimated carbon budgets are also highlighting the key processes (i.e., bacterial respiration) that need to be considered for an integration of atmospheric deposition in marine biogeochemical modeling.